When it comes to museum-quality furniture, pieces by Crawford Riddell originating in Philadelphia, Pennsylvania are making their mark. This is especially true of a particular bedroom suite that was commissioned by Henry Clay's supporters to outfit what eventually became the Lincoln bedroom. Of course, since Clay was not elected, the furniture purchased by the Whig party never ended up in the White House. The bedroom suite was transported after its purchase to Louisiana instead where a wealthy plantation owned used it in his home. The bed to the set was purchased by the Dallas Museum of Art for $450,000 in 2000, a great sum for a piece from that period, according to a related article in the New York Times. What came to be known as the Henry Clay Rosedown Plantation Armoire, another piece from this famed suite, was donated to the Louisiana State Museum by M.S. Rau Antiques of New Orleans in 2015 (see full story below). This donation furthered the precedent for recognition of Crawford Riddell’s craftsmanship, especially for these solid rosewood pieces. Are other Crawford Riddell pieces worth as much? Unless they have the same type of provenance as these museum pieces, probably not. But, any piece with Crawford Riddell’s stamped mark merits evaluation from an antique furniture expert to assess the style and quality before assigning a value to it. Additionally, attempting an amateur restoration on a piece of Riddell furniture (or any high end piece) is never a good idea. Collectors of high dollar antique furniture expect the finish to be original, so you can greatly diminish the value or completely ruin an important piece by attempting to refinish on your own. M.S. Rau Antiques, a French Quarter landmark in New Orleans since 1912, announced the donation of the Henry Clay Rosedown Plantation Armoire to the Louisiana State Museum in 2015. This rare piece was made as part of a bedroom suite by Crawford Riddell of Philadelphia for use in the White House, and it would have resided in what is now known as the Lincoln Bedroom had Henry Clay won the bid for the presidency in 1844. Instead, the suite was sold by Clay's supporters to Daniel Turnbull, an affluent cotton baron who used the furniture in his Rosedown Plantation in St. Fancisville, Louisiana. "We acquired this piece from the former owner shortly after the State of Louisiana purchased the Rosedown Plantation in 2000 and then sold it to a client," said Bill Rau, owner of M.S. Rau Antiques via press release. "We are thrilled to have re-acquired this piece and have the opportunity to donate a piece with such historical value to such an important museum." 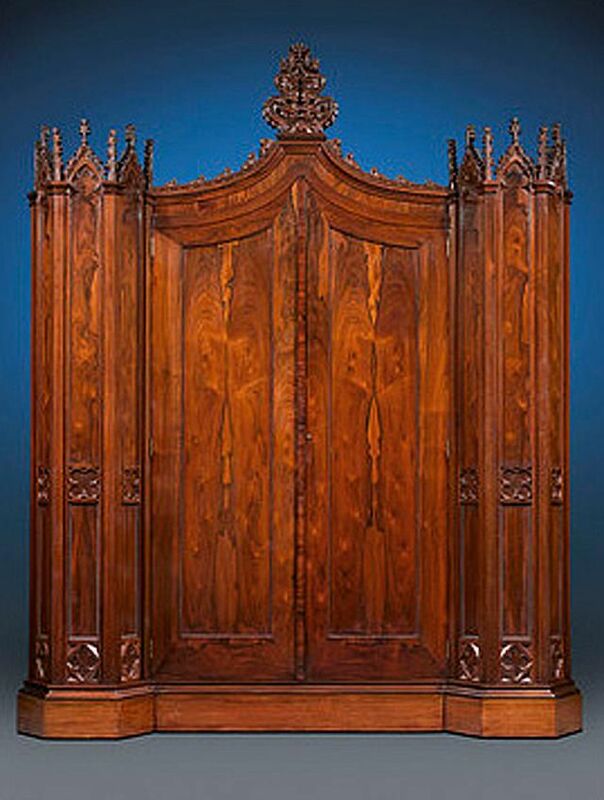 The armoire (shown above) is made of Brazilian rosewood (now extinct) with Gothic Revival styling. It is flanked by two gothic columns that open at each side for clothing storage, and thusly referenced as a “winged” armoire. The center doors open for additional storage including a built-in chest of drawers. Each section retains the original blue paint, and the drawers are also finished in Brazilian rosewood on the interiors. Overall, it is in immaculate condition having been moved into the plantation in 1845 and remaining there until 2000. A beautiful and finely crafted piece of furniture in its own right is made even more valuable by documented provenance and bearing the Crawford Riddell mark. This armoire falls into elevated category of masterpiece quality. Do You Know John Henry Belter's Rococo Revival Masterpieces?